It's a friendly competition and the goal is to have fun. The rules are simple, "Anglers must land bright adult Chinook and be at the weigh-in before 4pm." Guides are allowed to fish, but hooked fish must be passed off to anglers. Only anglers are allowed to land any hooked fish. Only Chinook salmon will be scored. Jack salmon will not be scored. Scoring is done by length: 1" = 1 point. Thursday's check-in will be between 10am & 5pm. Friday's check-in will be between 10am & 4pm. Fish entered after the check-in deadline will loose 5 points for each minute they are late. Anglers will fish four anglers per team. A drawing will be held Wednesday and Thursday evenings to match anglers and guides for the next day's fishing. 1st, 2nd and 3rd place trophies will be awarded to the angler teams and guides with the most points earned in the 2 days of fishing. 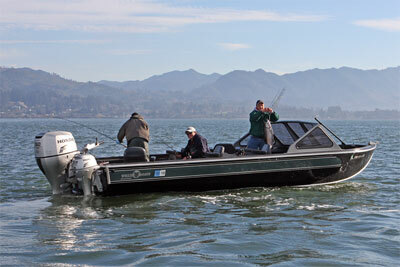 The angler and their guide entering the largest Chinook by weight will be awarded the "Big Fish" trophy.